1. Be a great role model. Find a positive perspective in your experiences, and explain why the choice you made is important. Adults know that the world isn’t all sunshine and rainbows, but children can forget this awareness at their age. Be someone they can learn from through both success and failure. 2. Help them feel comfortable with their emotions. The aged assumption that “boys should not cry, and girls should always be dainty” can hinder a child’s creativity and ability to tap into their wellspring of love for themselves and others. Fostering emotional well-being among children has actually been shown to avoid “mental illness” later in life, along with many other health and social benefits. Teach your child how to laugh, cry, and express their joy, and that it’s ok to do so. Let them live in an environment where they feel safe enough to communicate what they’re feeling, and what they want in life. 3. Teach them the law of attraction. The law of attraction simply states that you will eventually receive the opportunity, in some form, to achieve that which is in alignment with your most dominant thoughts. If children understand this concept, they can learn to focus on achieving everything from potty training to becoming President. Teach your children to think well of themselves, as they are now. Teach them to be kind and compassionate toward others. This simple 3 step process to the law of attraction will help you explain it to them simply. Also, have your child repeat positive affirmations in the mirror with you every day. Phrases like “I am creative, I am strong, I am a good friend, and I make a difference in the world” plants the seeds of positivity in their hearts, and impacts their lives in a tremendous way. 4. Be a motivator and encourager. Help your child believe that they can be their best. Encourage them to follow their dreams and to believe that they can achieve great things in life. Even if your child fails at something, motivate them to pick themselves up and carry on – teach them that in every outcome, there is always a silver lining. If your child was expecting to win first place at the science fair but didn’t, acknowledge their feelings. Talk about the cool projects, and how they can be inspired for their next project. Sometimes, the best thing you can do is say that you tried your best, look forward, and that another opportunity will be on the way. 5. Teach them how to focus on solutions. Followers talk about problems. Leaders talk about solutions. Problem solving is a critical skill kids need to gain confidence, continue thinking positive, and excel in life. Help them learn about the problem and what created it, then how to move past it and focus on a solution. Moving into the “solution zone” as quickly as possible will encourage them to always think positive, and be confident that answers are always out there. 6. Allow them the freedom to do what they love. To flourish in their own unique way, children need some freedom to do what they love. Guide children to safely find their purpose and passion. Create a learning environment from what excites them in life. Everything has a lesson, and it’s up to us to provide that lesson in the most engaging way to maximize a child’s learning. 7. Surround them with positive people. Surround children with a positive, uplifting environment. Explain to them that they are a product of the people they spend the most time with, and to try to associate with other people who also think positive. From this fertile positive environment, they can move forward in helping others think positive as well. 8. Encourage strong morals and values. Children can grow up to be strong, positive leaders if cornerstone positive morals and values are built from a young age. Knowing what’s “right and wrong” when interacting with friends, holding them accountable for their mistakes, and teaching them to follow through with commitments are all core principles of practicing positivity. To help them understand easily, talk about your own life experiences such as returning someone’s wallet or intentionally making friends with the new kid at school to welcome them. 9. Ask them about the positive events of their day. Instead of just asking how their day went, ask them about the positive things that happened during their day. These specific questions help them focus on their achievements rather than disappointments. When children stay focused on thinking positive, their positive experiences will only continue to grow. 10. Create a literacy-rich environment. Support literacy starting from an early age. It takes them to places they can embrace their own powers. A child that often reads is enriched with the power to strategize and solve problems. Give them library cards, provide puzzles, read a variety of books, play bingo, scrabble, and introduce books on the computer. There are even programs like Reading Kingdom that allows them to play online as they learn to read. 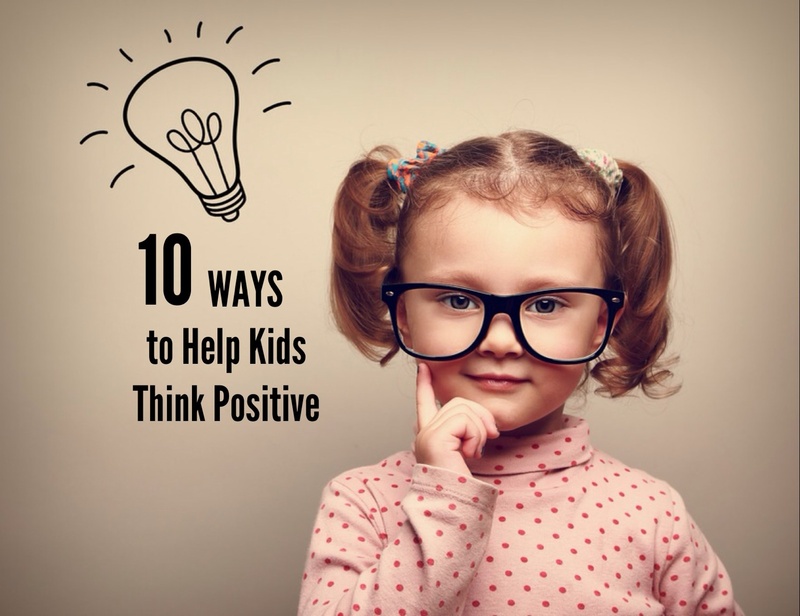 Your turn: Share your tips to help kids think positive in the discussion below!